Hallux Valgus is a painful condition that can both quite literally and figuratively knock you right off your feet. The more common term for hallux valgus is a bunion, or a visible bump on the side of the big toe caused by a bone structure problem. Bunions can cause your big toe to lean towards the second toe rather than pointing straight forward. Basically, the bunion or visible bump is the result of a bone-alignment problem which is more than likely caused by doing lots of walking in improper shoes. The more you walk on your feet this way, the more likely you are to aggravate the problem and require surgery. I had this visible bump on the right side of my toe for two years, before finally discovering what it was. The reason I didn’t ever suspect I had bunions was because I’ve associated the pain and swelling with infrequent gout attacks and/or a fractured toe. I’ve had both of these ailments in the recent past. Now, having experienced all three of these foot problems, I feel pretty well qualified to describe the differences between all of them. I also believe I know how to deal with the problem of bunions in such a way to prevent the need for hallux valgus surgery which I will explain later. Gout attacks come on rather suddenly, but also heal rather quickly with an anti-inflammatory pain medication such as Indomethacin. I would rate the pain of bunions as a close second to a gout attack. The pain is not quite as severe, but unlike a gout attack, it takes my feet several weeks to heal. With gout, the pain for me can be just as excruciating whether I am on my feet or lying down. Bunions can be excruciatingly painful, but I am usually able to manage the pain a little better by simply resting my feet. Staying off my feet as much as possible is the only way to help the bunions heal. Gout pain tends to be more in the joint of the big toe. 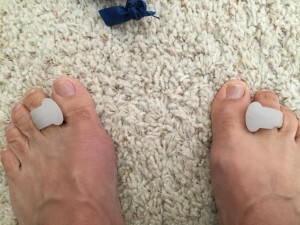 With my last bunion flare-up, the pain covered the upper and lower side of the big toe and even affected the bottom of my foot. Bunions can also cause some very uncomfortable throbbing at night and make it difficult to sleep. Getting out of bed can be a traumatic experience, but overall, the pain is far more manageable than the worst stages of a gout attack which is constant, excruciating pain and extremely sensitive to the mere, light touch of a bed sheet. The onset of bunions begins with a leaning of the big toe. Over time the angling of the big bone on the side of the foot produces the visible bump. In specific medical terms, there is a deviation of the first metatarsal or rotation of the hallux. This causes pain and makes it very difficult to wear shoes. A better definition with illustration can be found hear at Foot Health Facts. What causes it and how can I help it heal and prevent it from flaring up again? When I read that bunions are a progressive disorder, it made sense to me to address this in a proactive way. What Causes Bunions or Hallux Valgus? When it comes to the cause of bunions, I will specifically speak from my own experience. My first problem was that as a school teacher, I am constantly on my feet. My second problem was the inadequate shoes I was wearing which were not designed for long distances of walking. Dress shoes are simply not made for teachers. Not only am I spending a great deal of time walking around a classroom full of rambunctious fourth graders, but my school’s office happens to reside at the end of a very long hallway. Making the 100 yard hike to and from the office several times a day in insufficient, loafer-style, dress shoes was asking for trouble and I got it. When I analyzed the way my shoes felt and looked, I knew I had to find something that offered more support, but would still look presentable in slacks and a dress shirt. It made sense to me to start with a new pair of shoes or two. During the most painful time of my bunion flare-up, I had to find a pair of shoes that were wide and adjustable to fit over my inflamed foot. I happened to have one pair of black, cloth tennis shoes that I could wear while I tried to give my feet a chance to heal. Meanwhile, I found a pair of orthotic-approved shoes that seemed to offer both comfort and support. Never again, will I do any significant amount of walking in a pair of loafers. 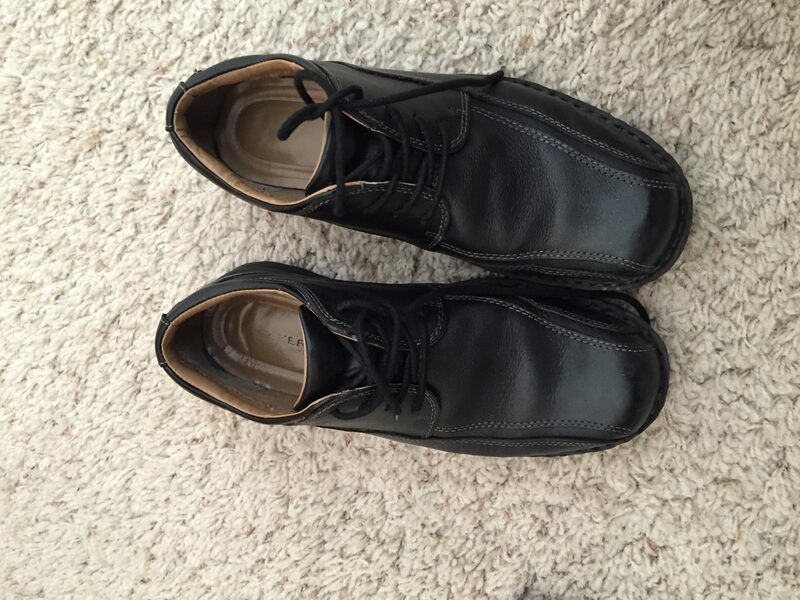 I paid about $59.00 for these Dr. Scholls shoes. While they are not specifically custom made for my bunions or feet, I felt they were a drastic step in the right direction over what I had previously been wearing. Addressing bunions all starts with the shoes. These particular shoes are made wide for my own foot size, yet still fit snuggly and are made well for walking and standing for long periods of time. Meanwhile, I found other ways to address the progressive nature of the developing bone structure problem associated with hallux valgus in both feet. They actually make bands specifically for stretching your toes. I simply made my own band using a piece of theraband material that I had lying around the house. The idea is to stretch your big toe away from the second toe in order to strengthen, straighten and train proper foot alignment. This really works, but you have to be consistent about doing it every day. I currently do two repetitions of 5 minutes each; once in the morning and once at night before bed. This might look boring and monotonous, but it seems to be working. My bunions are very nearly gone. See the video for instructions how to do this. Next to a decent pair of shoes, the DenadaDance toe spacers are the most worthwhile investment I’ve made in my feet. 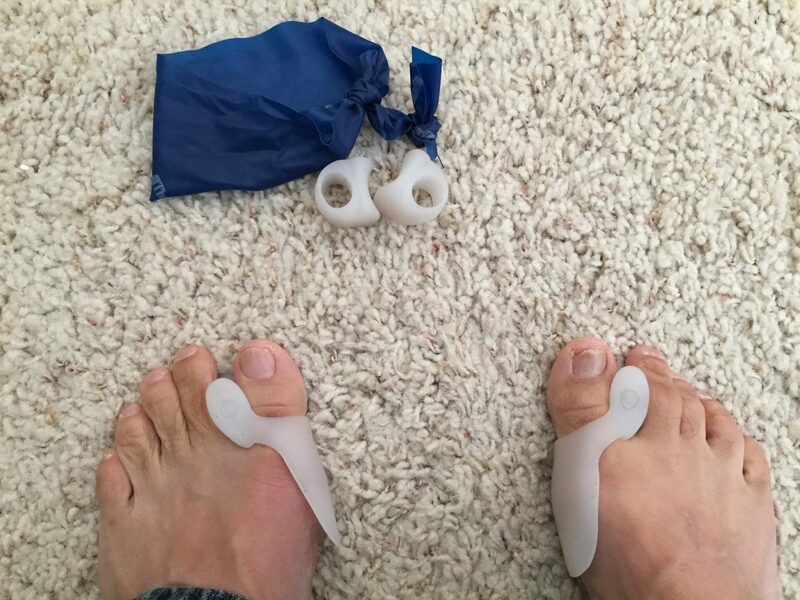 The Bunion Toe Spacers relief kit includes 2 x Big-Toe Protectors and 2 x Big-Toe Spacers with protective shield. The beauty of both of these items is that can be worn with your socks and shoes. During the work day, I wear the toe spacers with shield. The shield protects the side of my foot from painful rubbing of the shoe while the spacer helps keep that all important space between the big and middle toes. At night, right after my toe stretching exercises, I insert the toe spacers without the shields along with a pair of socks. They are comfortable wear all night long. You will notice from the photo the slightly visible bunion bump on the right side of my right foot. The left foot still has some slight swelling, but is getting better each day. You can see from the picture why the shields are helpful to wear with your shoes during the day. They really do protect that sensitive, red area that gets inflamed. I regret that I do not have a ‘before’ picture to show you how my feel used to look . You’ll have to take my word for it that the size of the bump is significantly smaller than it was before I started the bunion relief routine consisting of new shoes, bunion splint, toe stretching, and toe spacers. I am now into my sixth week of a very rigemented routine of taking better care of my feet. While this whole process does require some work, discipline, perseverance, it is worth doing to avoid future flare-ups and potential hallux valgus surgery. I hope you find this article and product reviews helpful. The only product that I was not completely satisfied with is the bunion splint due to its fragile quality and difficulty in fastening to the foot. There are literally hundreds of different types of bunion splints, toe-straighteners, harnesses, spacers, stretching devices, etc. 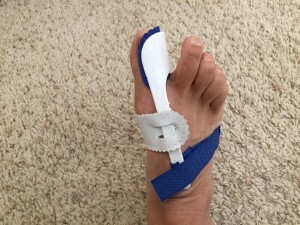 If anything, I would like to try another product similar to the splint that is warn over night without shoes. I would like to hear from those who have tried these other products. 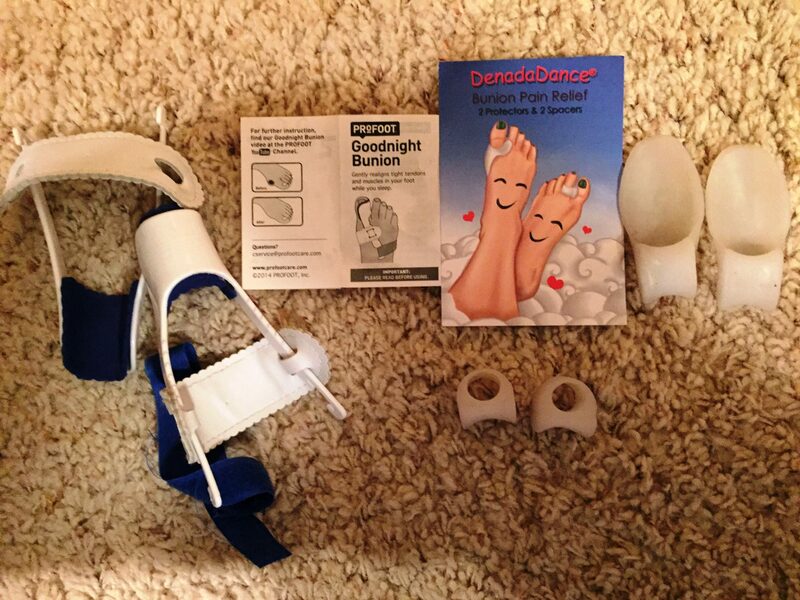 I have listed these various bunion relief products from eBay which has a great variety and selection. If you are suffering from Hallux Valgus problems of your own, please leave me feedback on the products you’ve tried, as well as your recovery routine and results. El Ultimo Agave Tequila. Low Price, but how Good?